Innovation is the catch word of the 21st Century, particularly in the developed world, as economies increasingly depend on the creation of intellectual capital, rather than on manufactured goods. Traditionally capital, resources and labour have been considered to be the primary instruments of growth. However, Robert M Solow, Professor at MIT, Nobel prize winner in economics in 1967, showed that 90% of economic growth stems from "technical change". Thus, the pursuit of technological innovation is vital to ensure the economic wellbeing of companies and even countries. The strong messages from government and competitors about the necessity to Innovate are well recognised. It is essential to business growth, competitive advantage and survival. 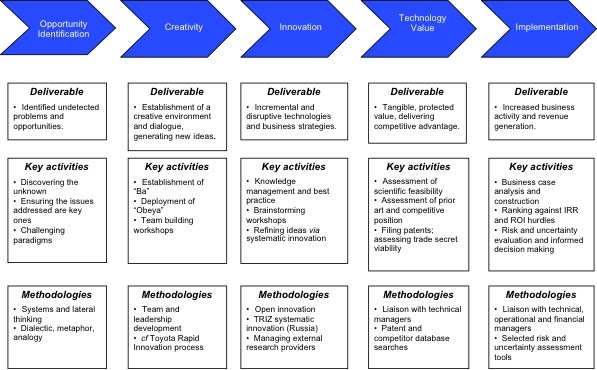 However, finding appropriate opportunities, developing an organisation's capacity to innovate, and making innovation consistently happen are in practice very difficult to achieve. otbSolutions is uniquely positioned to provide not only technical expertise, but also to assist organisations in developing theri own innovation value chain, from creating ideas through to realising business benefits via the production and protection of intellectual property, and ensuring that changes are implemented into operations. otbSolutions can assist companies to design and implement an innovation plan that is an intrinsic part of the overall business plan, and train and develop personnel to ensure consistent benefit delivery.